While Americans pay $1000 for a Galah on the illegal market and many Australians keep galahs as pets and delight their antics, the Australian farmer can not eradicate this grain-destroying bird quick enough. Galahs are probably the most abundant and familiar of all Australian Parrots. Scientific opinion about their classification is divided and they are placed either in a genus of their own as Eolophus roseicapilla or with cockatoos as Cacatua roseicapilla. Medium sized birds growing to about 35 centimeters in length, galahs are grey above but have a rosy chest and underparts and white or pink crest. Their bill is bluish white and legs dark grey, the eyes are dark in the male and pink in the female. 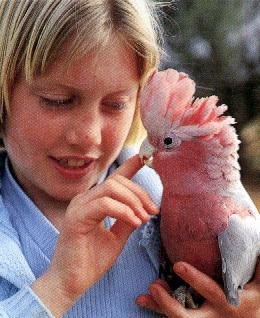 Renowned for their beautyand also their ability to mimic human voice, galahs are popular pets. The galah is one of the few native Australian creatures that has benefited dramatically from European settlement and cultivation of the land. Before British colonisation they were rare, east of the Great Dividing Range but are now found over most of the continent, including Tasmania and some offshore islands. Only in quite recent times they have become established along the eastern seaboard and in the southern half of Western Australia. Observers have noticed that galahs vacate the far north of the Northern Territory during the worst of the wet season but are common there at other times. In arid regions they remain fairly close to water sources. The great extension in range and burgeoning of numbers is largely due to the growing of grain, the increased provision of water foe stock in arid regions, and irrigation shemes which ensure a virtual year-round supply of food. Typical birds of open forrest and grasslands, galahs are mainly seed-eaters and have taken quite readily to to introduced cereal crops. They appear to be particulary partial to wheat and oats, but have also developed a taste for the seeds of pasture grasses and oil seeds such as sunflower and safflower. To round out their diet they eat roots, foliage, flowers, nuts, fruits and insects. Like most cockatoos they are considered pests in grain-growing districts as they invade growing crops as well as harvested seeds. Their depredations have been held responsible for the demise of oilseed cropping in the Wimmera district of Victoria and it is estimated that cockatoos destroy about one-fifth of the totalgrain crop in New South Wales each year. Galahs are not protected in New South Wales, South Australia and parts of Western Australia, and the Victorian government has recently agreed to lift restrictions in relevant areas of the state. Methods of eradication range from scarecrows to shooting, trapping and (albeit il-legally) poisoning. Galahs provide some benefits, too, as they eat large large quantities of the seeds of many weeds. Although they occur in greater number in agricultural districts, galahs have made themselves at home in urban areas as well - feeding in parks and gardens, on golf courses and sport fields, and even nesting in street trees. They feed in flocks of usually 30 to 100, which are made up either of pairs (which usually mate for life) or of non-breeding younger birds. Occasionally these join together and flocks of many hundreds may be formed. Galahs are fond of aerobatic displays, which are incorporated into courtship rituals but also performed daily before roosting and during rain storms. These are accompained by much swooping through the treetops (or telegraph poles) and loud, raucous screaming. Galahs are strong, fast flyers and reach speeds exceeding 50 kilometers per hour.